Even though this is no longer a ink up, I’m still going to participate in sharing the current happenings in my life on most Sundays. August is over. Thank goodness. I’m not a summer lover at all. Needless to say, I was ready for fall back in June. Almost my entire month of August was spent looking forward to fall, as you can see. 1:: Madewell dress love. So much love that I took the plunge on 3 more since this one- two of the tunic variety and one more dress. Can’t wait to get a fall/winter one for that capsule. 3:: One more sign of fall: Pumpkin Spice lattes. My favorite. 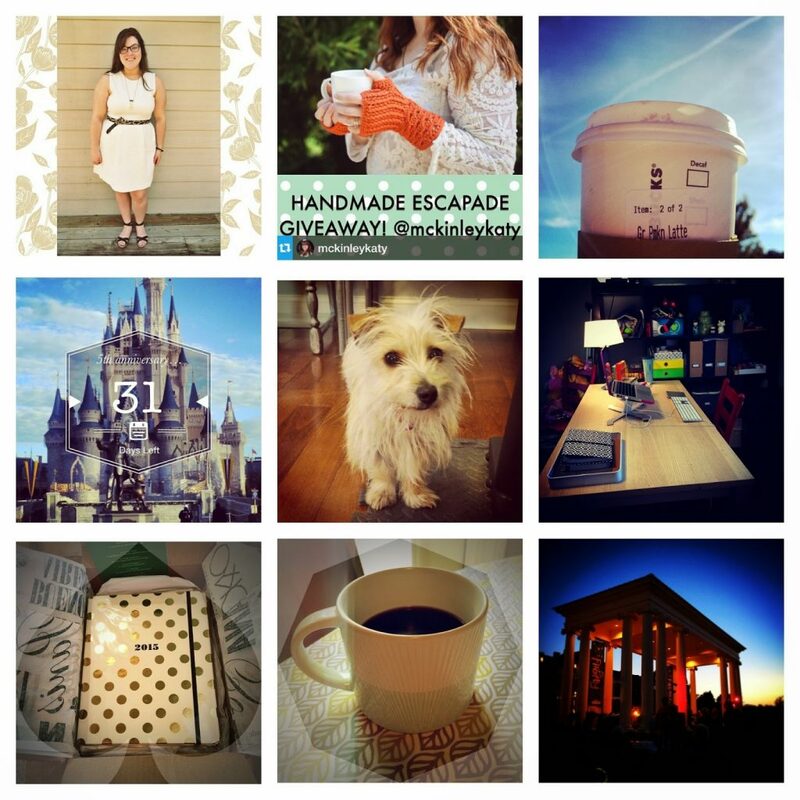 Make sure you enter to win a starbucks gift certificate and PSL print in the giveaway I’m co-hosting with Nicole. 4:: It’s the final countdown! We’re currently t-minus 19 days from my next Walt Disney World trip! 5:: Checked in with the doge this month. She’s still as cute as ever. 6:: Cleaned off my desk completely! Big accomplishment. It’s got stuff on it again, but I attribute cleaning it off to getting my booty back in gear this month. 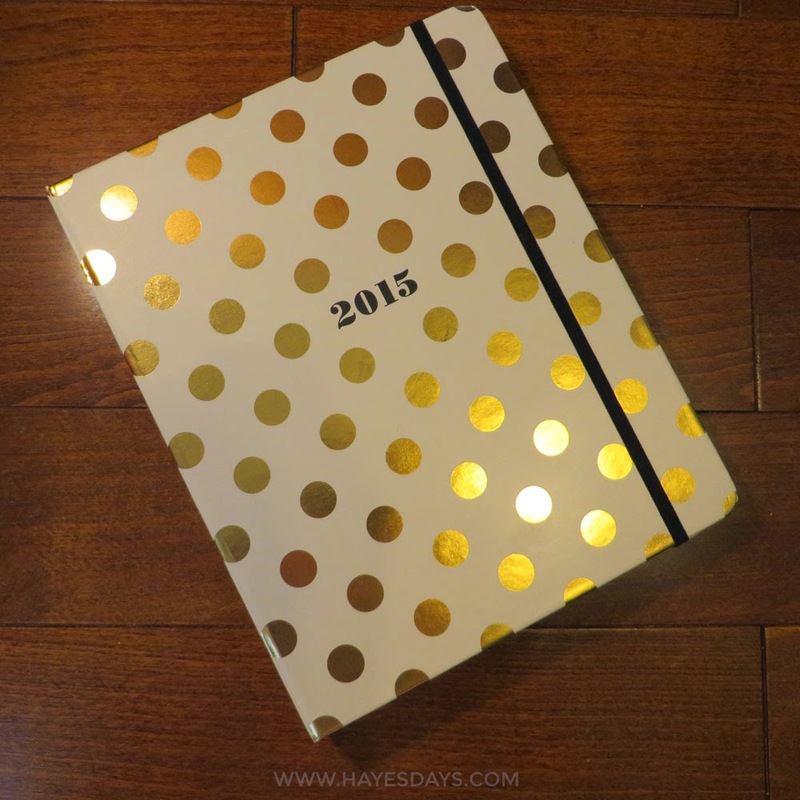 7:: This KS agenda came into my life, and I love the gold dots so much so! Can’t wait to share reviews of the other planners on their way to me. See my full review on the KS agenda here. 8:: Another “finally” happened in August. My “beach house” mug came home with me. Love it. 9:: Firefly festival. We were out on a Saturday night! Shocker! Honestly, I can’t remember if this was August or not! lol. It’s been a long/short summer. The blog, as well as some posts, received subtle make overs. Read about the updates here and some fantastic resources. Falling in love with a denim vest and a white denim jacket. That white denim jacket just might make me like summer. The very last Sunday Currently link up. It was my 3rd, but the 100th for the link up. Now I’m doing my own thing. Karen is ready for fall with these swoon worthy fall picks. Heather brings up some thought provoking points regarding a recent Glamour shoot. Lindsey is also as ready for fall as I am and already has some fantastic shoes picked out! Brittney rounded up five of some of the most amazing Friday picks I’ve ever seen. Caroline and Anuschka have both inspired me to delve deeper into creating a capsule wardrobe. How was your August? Enjoying your long weekend? This year is flying by! I cannot believe this is my seventh budgeting bloggers post. I participated in spirit in January, so I don’t count it. At first, I was like yay I did really well! Then I found another receipt and then I was like oops… my bad. Though I ended in the good, I once again bought what I feel like was a lot with out getting full use out of each item I brought home. I haven’t actually purchased anything in August since the Madewell dress, and that was very early on in the month. I spent the month wearing what I bought and creating a capsule wardrobe for the remainder of summer temps and putting thought into my fall one. You see, I used my very last available hanger when I got that dress and the last bit of room on any shelf/bar/rack in my closet and I still didn’t wear half of it. And I knew I still had a large tupperware bin in the basement full of winter stuff plus a dresser full in the room. I hadn’t been doing as well as I wished with mindful spending evidently. There was more than enough and it wasn’t getting worn. Deciding to do a capsule wardrobe has been the best decision for helping me shed unwanted items and learn more about what I wear and get one step closer to building a fully functional wardrobe for myself. More on that this coming week. I love everything I brought home, which is why it was hard to narrow down the focus and start a capsule, especially with my new found love for madewell dresses, tunics, and tops. I got some amazing poshmark deals too. The Phillip Lim is so gently used, I thought it was new! Now that I have one, I can totally understand why everyone clamored to get it! It really is a great bag! Besides the Madewell summer friday dress, the two stunners from left field were the denim vest and the white denim jacket. Both are nothing like pieces I have ever had or do have and they’ve proved to be star players in my closet. They were pricey (for my standards) additions, but were well worth what I spent, just like the madewell dress. So I promise more of what I’ve been doing the past 15 days with a capsule wardrobe this week now that the Internet is back. How did you do this month? Two weeks ago a new phone case came in the mail. When I pick a phone case, it’s a big commitment. I don’t switch them up all that often, but when I do, it’s a milestone. That case has to be my instant favorite for months to come. The one I just got definitely fits the bill! For some reason, it always makes me feel like I have a brand new phone, just by switching the case. Clean, fresh, new! I’m easily amused like that. The winner of the last new phone case is this one with the rubber inlay from Rifle Paper Co. So far so good! It survived an 8 foot launch, which is more than I can say for previous cases. If you’re in the market for a phone case, check out the runner-ups and other favorites. Yeah, my thing for gold polka dots shines through to this week too. I have the polka dot fever! Ultimately, I really wanted to try a Rifle Paper Co. case, they were having a sale, and I loved the colored squares design too much to pass it up. It was a good choice too because I can see myself loving it for the year to come! Do you change cases all the time? Use a case at all? Don’t forget to link up with Katy, Nicole, and myself for my favs on Thursdays below. I’m not sure if there’s a more appropriate place to be writing this post than Starbucks. Unfortunately, the county easement mowers cut my Internet line AGAIN! On the other hand, that means I get to sit at Starbucks and compose my blog posts with a pumpkin spice latte in hand. I will also take this moment to apologize for the sparseness of my social media and blog presence this week since they won’t be out to fix my Internet until FRIDAY! Oh the joys of being dependent on the Internet. If you don’t know by now, I’m going to come right out and say it: I LOVE FALL! It’s my absolute favorite season for so many reasons. So much so, that I demanded we be married in the thick of fall in my favorite month, November. Being such a big fan of fall, I’m also a huge fan of pumpkins. Pumpkin seeds, pumpkin soup, baked pumpkin. It’s all delicious. 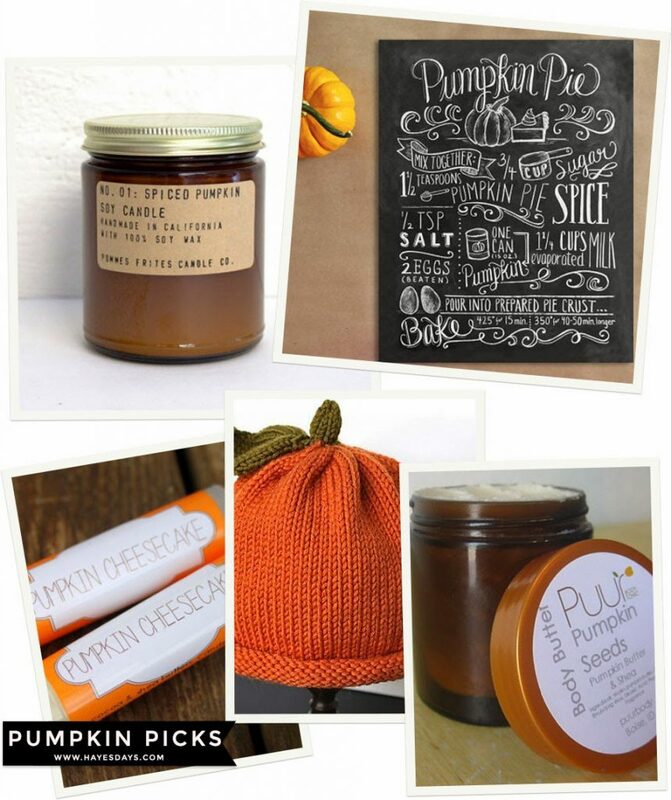 Get ready to see a lot of fall love, starting with some adorable pumpkin items I’ve picked available on Etsy. Also to celebrate the impending arrival of fall and pumpkin season, Nicole of Designs by Nicolina and I are co-hosting a PSL print and Starbucks gift card giveaway! Enter below to win! Hurry hurry hurry because it ends September 1. Essentially this post could be titled, “My Favs on Thursdays:: Being Organized” because I LOVE being organized. You could say to a fault. Therefore, I love planners. I have electronic planners and paper planners. They all coordinate, but I always get sucked back to the paper planner. I’m a visual learner– and rememberer. It helps me to remember if I write it down and see myself write it down. As my life has changed, the quest for a perfect agenda has reemerged. I’ve ordered three to compare. 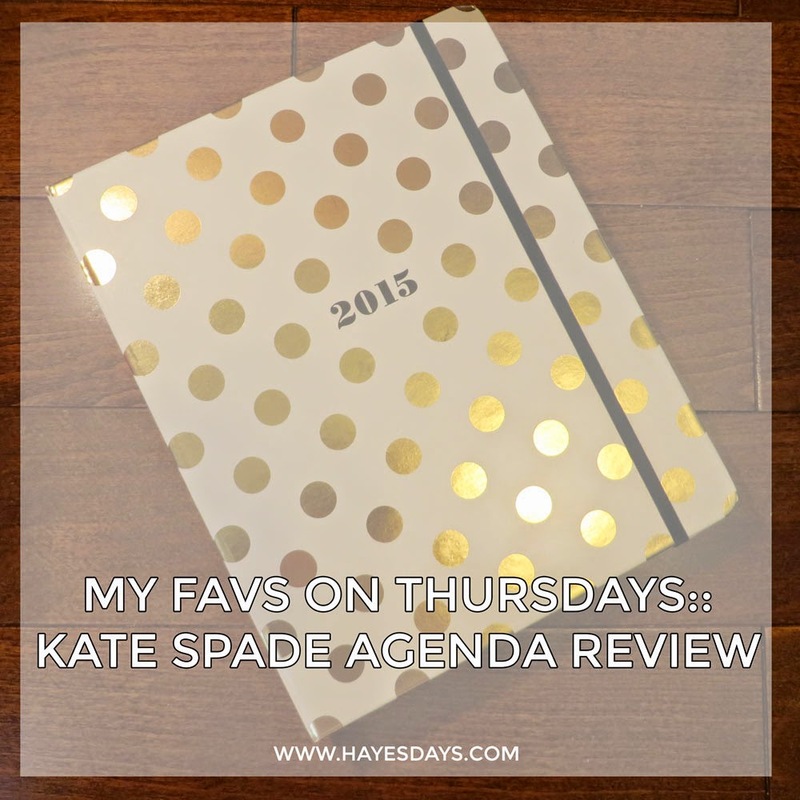 The Kate Spade Agenda is first since I’d heard such good things about it! The next two will come in September and October. First up on my agenda criteria is the cover. Kate Spade agendas are second to none. 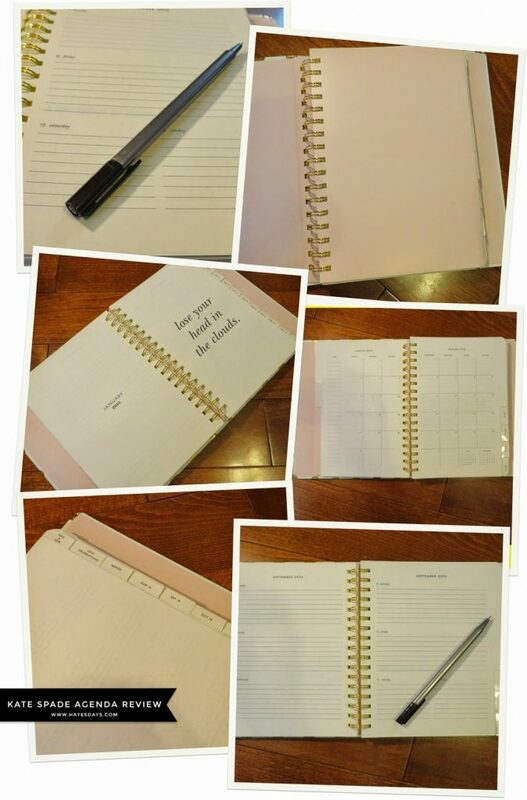 Other agendas pick patterns to be like Kate Spade agendas! You can see all the cover options here under stationery at the Kate Spade website. Despite reviews saying that the dots rubbed off, there was one very helpful review saying to use spray sealer first and the dots would stay. I’ve been using it for a week and I sprayed the cover and the dots still look like new. Third, the layout. Inside you’ll first find a pocket for extra pieces of paper, invitations, etc. before getting into the meat of the matter. Once past the pocket there are pages for notes, important dates, and year at a glance. Then there is a tab month by month starting in August 2014 to December 2015 so I immediately started carrying this one around. Each month tab has a quippy saying to start you out. The next page is that month at a glance with squares to fill in. The individual days are displayed via week view, as seen in the first and last squares below. This space is a tad small for my liking, since I like to also include my to-do list in my planner. I have been keeping my to-do list on post-its, which works for me too, but I would love for them to have just a little more space. Maybe 2 two-page spreads for the week? Four pages total. It would make a huge difference. I also consider the paper when selecting an agenda since I write with felt tip pens or fine tip pens that can both often bleed through the paper. The fine tip pens were perfect. The felt tips bled a little, so I’m just going to stick with my fine tip, which is not enough to make me give the planner a lower score. Overall, for my needs, the Kate Spade agenda is an 8.5/10. These agendas are well made. The spirals are protected. The cover is sturdy. It stacks up very well against my judging criteria under cover, size, layout, and paper. I would recommend it more so for those who like to be organized but keep their lists elsewhere. The price isn’t bad either for it’s comparison models. If you want one, check out all the stats and other reviews here. What kind of methods do you use to stay organized? In the market for a planner? Which are you considering? Don’t forget to link up with your favorites! I know what you’re thinking– “There’s new stuff? Where?” Trust me, if it wasn’t my blog and I didn’t spend time on it each day I wouldn’t notice either. The changes are small, but I hope they help for better navigation and make it easier for you to find what you want on my blog! CATEGORIES:: The categories under the header have changed. “About me” and “Contact” are still there, but there are new categories for my posts. Of course, “Disney” is still there (and will be coming full force next month while I’m there), but the other umbrellas for my posts are now “Lifestyle,” “Outfits,” and “Projects.” Style was a little too broad and so many of my posts were falling into that category when they really needed to be separated. Anything related to a beauty routine, products, tips, and any personal posts will be under lifestyle now. Outfits is just for, well, outfits. Projects will be projects around the house, blog– anything that lends itself to being creative. DISCLOSURE:: In an effort to be as professional as possible, I’m trying to be clearer about the necessary disclosure notifications. You will find my statement linked in my sidebar, sponsorship page, and about me page. Also I’ve been trying to remember to put notification about affiliate links near my affiliate links. Jana has amazing tips for organization, promotion, and communication. She also goes in depth with Hootsuite and Passionfruit Ads. She was even so sweet to send me a link to her sponsor checklist! That’s the kind of blogger you want to sponsor! 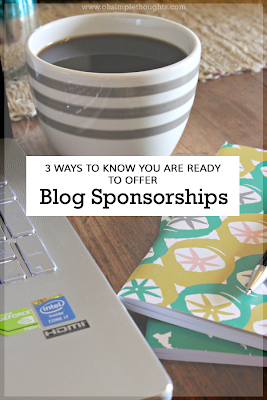 Rachel has three great tips that I pondered over for probably weeks before setting up my sponsor page. I think they’re perfect for any budding blogger. She has also found three great resources for printables to keep you organized. The last round of tips also comes from a Rachel, but a different one. Her tips are short and sweet and the ones to keep in mind through your entire journey. One is even to quit if it gets overwhelming. She also recommends the buffer app for social media management. I found all of these amazing blogs via their pinterest pages. It’s where I get most of my blog advice. Check out my “for the blog” pinterest board for more people that know more about blogging than I probably will ever dream to. 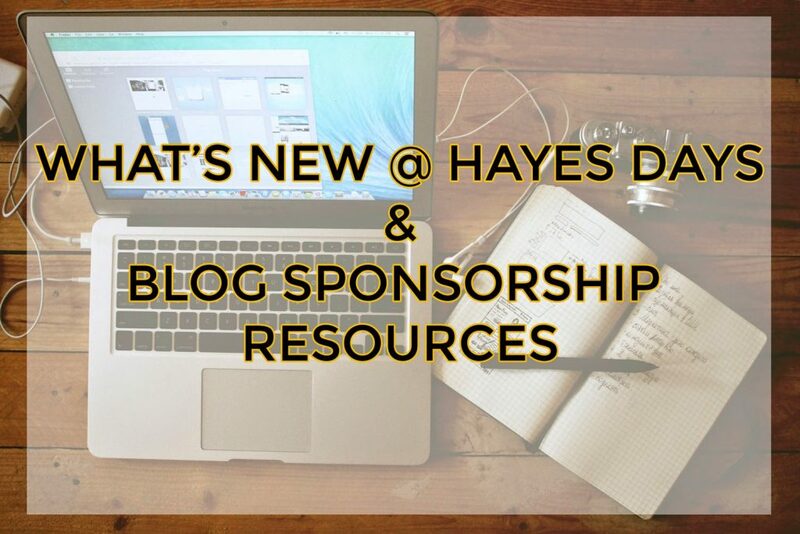 Follow Meghan Hayes’s board for the blog on Pinterest. What do you think about the changes? Do you have any tips for a blogger who is on a steep learning curve?